In the last two lecture series Foucault gave at the Collège de France in 1982-1984, published under the titles The Government of Self and Others and The Courage of Truth, a genealogy of the obscure concept parrēsia – “truth-telling”(dire-vrai) or “free-spokeness”(franc-parler) – is unfolded. Parrēsia was, according to Foucault, one of the core principles of Athenian democracy together with – but sharply distinguished from – isonomia and isēgoria; principles that are roughly translatable as equality before the law and the equal right to address the assembly for all citizens of Athens. Though all Athenian citizens have an equal right to speak (isēgoria), only a small elite, those who are in the foremost rank (prōton zugon) and of extraordinary personal and moral qualities, are meant to claim their right to address the assembly. Where isēgoria (at least formally) is for everyone, parrēsia is for the few. These few are those who aspire to ascend in the ranks of society through the agonistic game of recognition in order to take charge of the city through their parrēsiatic practice. The game of truth-telling is the institutional framework designed in order to select the genuine elite among the competitors. Thus, Foucault argues, ancient democracy has an ambivalent relationship to political elitism: on the one hand, the right to speak is equally distributed (isēgoria), on the other hand, not everyone can speak (parrēsia). Democracy and parrēsia therefore relate to each other in a paradoxical way: parrēsia is only possible within the formally equal democratic agonistic game of truth-telling, but at the same time parrēsia introduces elitism into democracy completely different from the egalitarian structure of democracy. Parrēsia is therefore a threat to democracy. However, at the same time, democracy cannot do without parrēsia since it is the core of the democratic form of government. Though paradoxical, the game of parrēsia, Foucault argues, is necessary for the survival of democracy. Parrēsia is the institutional framework that allows the political elite to ascend in a legitimate manner in order to take charge of the city. Where the institutional framework of modern democracy makes it possible for the political elite to be selected by elections, the institutional framework of ancient democracy had the political elite selected by the agonistic game of parrēsia. This game of truth-telling, which allows for the genuine political elite to take charge of the city through their practice of parrēsia, is what Foucault presents as the core of ancient democracy. Foucault’s ideal typical example of “political” parrēsia is Pericles as he is represented in his famous speech in Thucydides’ The Peloponnesian Wars. In order only to have the genuine political elite ascend in the democratic game of truth telling, the parrhēsiast speaks at a very high but uncertain risk which might include ostracism or death penalty. The parrhēsiast should therefore find what he wants to say so important that he is willing to risk his life in order to frankly say what he finds to be the truth; an institutional check that one would think discourages most people from addressing the assembly. This is why courage is needed in order to engage in the practice of truth-telling. The problem is, however, that after the death of Pericles the institutional check of the risk of truth-telling no longer was perceived as successful. The core of the critique of the fourth and fifth century B.C, but also more generally of the ancient democratic institutional framework characterized by parrēsia, is, according to Foucault, that it cannot discriminate between “good” and “bad” parrēsia. That is, the political practice of parrēsia can be misused by the good rhetorician or the demagogue through flattery or “false truth-telling.”1 The problem is that the institutional framework of democracy, constituted in order to have the elite ascend, allows all good speakers to ascend; also those who do not have the extraordinary qualities of Pericles. The game of truth-telling can therefore not distinguish between the rhetorician and the parrēsiast. At least, Foucault points out, this seems to have appeared as a problem for the Greeks after the death of Pericles. A more contemporary formulation of the problem is that of populism: those who have the ability to charm the assembly will be able to take charge of the city. The problem of the inherent danger of “bad” parrēsia in a democracy is according to Foucault of serious nature for the Athenian democracy because parrēsia is the governmentality of the polis: “If democracy can be governed, it is because there is true discourse.”2 The relationship between democracy and parrēsia is thus paradoxical in yet another way: on the one hand, democracy cannot exist without parrēsia, but on the other hand, the equality of democracy gives birth to the “bad” parrēsia that is a constant threat to the survival of parrēsia within democracy. Thus democracy and parrēsia, though mutually constitutive, present inherent threats to one another. This shift away from the “political” parrēsia of democracy is explained by Plato (or whoever is the author) in letter V: bad parrēsia has corrupted the Athenian population to such an extent that they are beyond the scope of reform. According to Foucault’s reading of letter VII, the shift is, however, not merely away from democracy but also from political action as such. In light of Plato’s negative experiences both with oligarchy and democracy (exemplified by the unjust treatment of Socrates both by the thirty tyrants and by the ekklēsia), Plato realized that political action and parrēsia no longer were possible. It is here important to clarify that the role of the philosopher as a parrēsiastic advisor does not consist in stating what the content of politics should be; the philosopher is not a “political expert.” The education of the Prince’ soul, the philosophical ergon, is the education, not primarily in mathēsis (content of knowledge, or a philosophical doctrine) but in askēsis (a mode of life, the philosophical life): “the reality of philosophy is its practice.”6 This practice is however not primarily philosophy as discourse (logos) but the work on oneself, or a relationship of self to self: “The reality of philosophy is the work of self on self.“7 The role of the philosopher is, so to speak, not to teach the prince what he has to do, but who he has to be. Philosophical parrēsia is the education of the prince’s soul in the philosophical mode of life, askēsis, which is a government of oneself in order make the prince become a philosopher. In this way, philosophy and politics correlate in the education of the prince’s soul. Philosophy and politics ought not to coincide in a doctrine: “I think that the misfortune and ambiguity of the relations between philosophy and politics,” Foucault writes “stems from and are no doubt due to the fact that philosophical veridiction has sometimes wanted to think of itself in terms of (…) philosophical doctrine […] Philosophy and politics must exist in relation, in a correlation; they must never coincide. This, if you like, is the general theme that we can extract from Plato’s text.”8 The only place where philosophy and politics coincide is in the soul of the well-educated prince. This is, according to Foucault, the genuine Platonic meaning of the “philosopher king” and the true meaning of the “mythical game” of the Republic. In this way, Foucault argues, the idea of the government and care of the self is pivotal to the parrēsiastic practice; an idea which is even more visible in the life of Socrates. One important aspect of the philosophical selfhood, according to Foucault, is expressed in how the conflict between philosophy and rhetoric is portrayed in Plato’s the Apology. This conflict is important for Foucault because he argues that a fight over the monopoly of parrēsia took place between philosophy and rhetoric. Where rhetoric is a skill (tekhnē) which allows the speaker to persuade his audience independently of the rhetorician’s own beliefs, the philosophical speechtakes its meaning, not from a relationship to the audience, but a relationship to the speaker himself. For this reason, Socrates describes himself as a truth-telling man without tekhnē. This non-technical form of speech is characterized by a harmony of truth (alētheia) and the belief (pistis) of the speaker. Where the rhetorical language is crafted to produce effects in the audience, the philosophical parrēsia is a frank statement of what the speaker believes to be the truth.Philosophical parrēsia is thus characterized by an authentic relationship to the self; a care for the self. It is characterized by a harmony between speaking and living; a life in harmony with virtue. “Philosophico-ethical” parrēsia is, however, for Socrates more than the refusal of becoming a subject of an unjust political action. 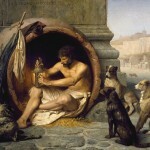 The philosophical parrēsia which Socrates lives—“the task he had decided to pursue until his last breath, the task to which he had bound his life, and for which he refuses any payment or reward”11—is to listen to anyone, rich as poor, and help them understand that they should not care about wealth or glory, but about themselves. And, that caring about themselves primarily consists in “knowing whether or not one knows what one knows.”12 That is, philosophical parrēsia is for Socrates to cure people of the common and false opinion that corrupt their souls and have them think for themselves. A true life is a life free of prejudice. The site of philosophical parrēsia has thus shifted from the prince’ soul to the lives and souls of all the people Socrates met.Socratic parrēsia is thus practicing philosophy itself, caring for oneself and telling others to care for themselves. 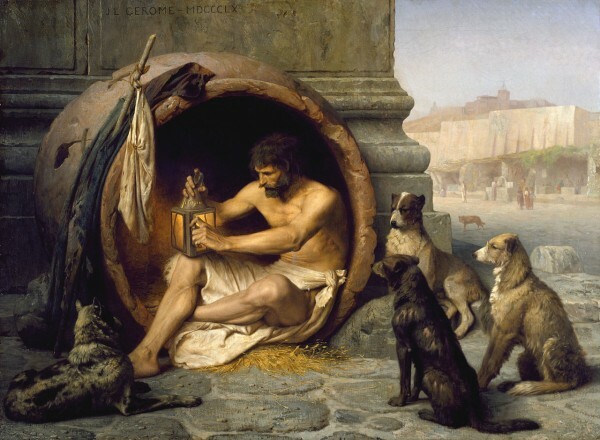 The understanding of philosophical parrēsia as a true life, or beautiful life, is even more thoroughly manifested in the life of the Cynics with Diogenes (most often referred to as “Diogenes the Cynic” or “Diogenes in the Barrel”) as the prime example. To underline this, Foucault refers to a description by Diogenes Laertius of Diogenes the Cynic: when Diogenes is asked what the most beautiful in men is, he answers: parrēsia. For Diogenes, the true life is the exercise of parrēsia. The Cynics’ parrēsia is the full manifestation of “ethical” parrēsia because they barely have a “doctrine,” that is, the theoretical framework of the cynics is rudimentary and that is exactly something they take pride in. What is at stake in Cynic philosophy is not mathēsis but askēsis; what is at stake is the true and beautiful life. Though the life ofthe Cynics can be understood as closely related to Socratic parrēsia as living and speaking in accordance with a conception of the true life (Socrates’ refusal to become an unjust man), the Cynics mode of life is more than a harmonic life in accordance with certain virtues such as temperance, courage or wisdom. The cynic life is a highly codified life; a true and beautiful life. The core of this life is that one practice the “scandal” of truth by words and deeds. The cynic life is a life of renunciation of material wealth: “The Cynic is the man with the staff, the beggar’s pouch, the cloak, the man with the sandals or bare feet, the man with the long beards, the dirty man.”15 The Cynic has no family, no household, and most astonishingly, no country. This renunciation of everything that for the Greeks signified a dignified life makes the Cynic independent and free. Since the Cynic does not depend on anyone his is “sovereign” of his own life. No one can take his property because he does not own anything; no one can ostracise him from his fatherland because he has none. Since mathēsis plays next to no role in Cynic parrēsia, the only way to learn Cynic philosophy is by living a cynic life. For the Cynics, teaching philosophy did not consist in passing on knowledge but in moral training. Foucault gives an example hereupon by referring to the way in which Diogenes taught the children of Xeniander: Diogenes taught the children to wait on themselves without calling upon servants or slaves, he taught them to wear simple clothes and walking without shoes, he taught them to walk on the streets and keep their eyes low, he taught them to hunt their own food etc. In this way, the children went through an “apprenticeship in independence.”18 The Cynics are for this reason, according to Foucault, one of the first manifestations of philosophical “heroism”: the Cynic is one to follow and imitate if one desires to live a true life; a genuinely sovereign life. The cynic life is true life as the government of oneself. —Foucault, M. (2010): The Government of Self and Others—Lectures at the Collège de France, 1982-1983. New York: Picador. —Foucault, M. (2011): The Courage of Truth—Lectures at the Collège de France, 1983-1984. New York: Picador. I read this article and found it very interesting, thought it might be something for you. The article is called Parrēsia: Notes on the Thought of Michel Foucault and is located at http://criticallegalthinking.com/2014/09/11/parresia-notes-thought-michel-foucault/.